Cheim & Read was founded in 1997 by John Cheim and Howard Read. The gallery works with an international group of leading contemporary artists and estates, embracing diverse artistic practices, from painting and sculpture to photography and video. This group of artists has exhibited extensively in museums and galleries world-wide, and are regularly included in exhibitions such as the Venice Biennale, Whitney Biennial, Carnegie International and Documenta. 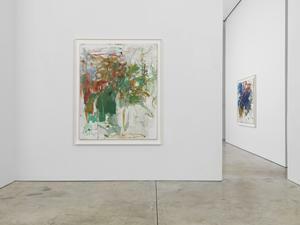 Cheim & Read is known for monographic exhibitions, including comprehensive, museum-quality surveys of work by Joan Mitchell (Paintings from the Middle of the Last Century, 2018), Louise Bourgeois (Spiral, 2018), Lynda Benglis (2016), and Al Held (Black & White Paintings, 2016). The gallery is also acclaimed for organizing historically significant group exhibitions, including The Female Gaze, Part Two: Women Look at Men, (2016), a show of women artists’ depictions of men, and The Horizontal, (2017), a survey of the horizon in abstract art ranging from 1937 to the present. Established in New York City’s Chelsea neighborhood in 1997, the gallery will relocate to the Upper East Side in 2019. Cheim & Read is committed to protecting your personal data. We confirm that your personal data will not be sold or shared with any outside sources not affiliated with us without your consent. We value your privacy and will be as transparent as possible about how we use your personal data and confidential information. Our correspondence keeps you up to date with relevant information about our exhibitions, artist and gallery news, art fairs, gallery events and related matters. We do not track or share email subscriber information for any purpose. If you would like to continue receiving correspondence from us, you do not have to do anything. You will, thereby, grant us permission to continue to inform you about our activities. If you prefer to no longer receive our email notifications, please click the "Unsubscribe" link that can be found at the end of these notifications, or please contact us at gallery@cheimread.com.